Hygiene is paramount - make sure everything you use is clean including pots and secateurs. Give the pots a good wash in hot soapy water and spray or wipe your secateurs between each cut with metho. 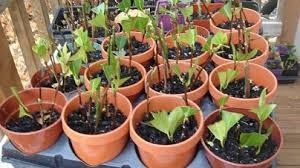 Collect good quality healthy plant material - taking cuttings from a dying plant is not the way to go nor is it a very good idea to take cuttings from something that is suffering from pest or disease infestation. Take cuttings that are young, but firm from healthy plants. If you cannot propagate the cutting immediately, store it in some newspaper moistened with water in a plastic bag and keep cool. If you have been invited to take cuttings from a friend's garden take your own 'kit' - an esky, ice brick, plastic bags, newspaper, secateurs, metho, labels, permanent marker and a spray bottle of water. As a general rule cut below the node/leaf joint on the base of the cutting and above the node/leaf joint at the top of the cutting. A really good plant to practice on is hydrangea as the buds and leaf nodes are very prominent. Some leaves should be left attached, but no buds or flowers. Trim back leaves to half their size so the cutting doesn't loose too much moisture. Another good idea is to spray the cutting with a preparation that cuts back expiration. If you are propagating a number of plants at the same time, drop them into a container of diluted seaweed before placing them into the hormone powder/gel/liquid and into the pot. By using a hormone product the chances of success are far greater, some people use natural honey. Don't use potting mix but a good quality propagating mix or home made compost. Water plants in with seaweed. Place in light shade and water each week with seaweed solution. Never let your cuttings dry out or sit in a saucer of water. Pot on into a good quality potting mix or directly into the garden once the roots have begun to show through the base of the pot.